Philadelphia Police and the Fraternal Order of Police have had enough with the mistreatment and disrespect towards law enforcement officers all across the country but especially within their jurisdiction. The marxist leadership of both city councils and Mayoral offices continue to allow violent savages to run amuck whilst tying the hands of law enforcement who take an oath to protect and serve. 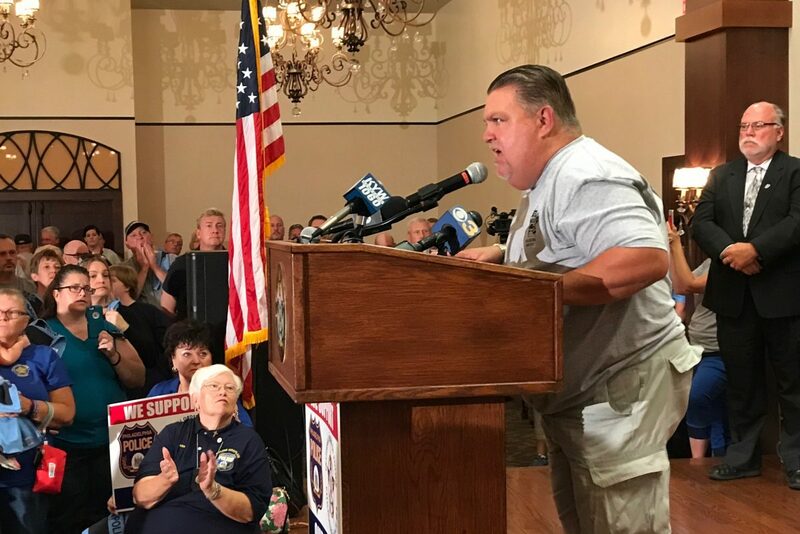 The FOP President John McNesby has had enough, and held a rally of solely police officers and their supporters at the “Back The Blue” rally inside the Fraternal Order of Police Lodge 5 headquarters in Philly. They've had violent criminals engaging in complete anarchy in the streets while being told to stand there with riot gear and not make arrests, all while having bottles of urine, stones, bricks, human feces, and a variety of other things hurled at them. It's disgusting, it's a disgrace, and it's flat out wrong. After a police officer was involved in the shooting of a civilian last week Black Lives Matter rallied outside the officer's home harassing his family and endangering their safety, and the Fraternal Order of Police President says he's sick and tired of it being allowed. During the Back The Blue rally FOP President said that Black Lives Matter are like “A Pack of Rabid Animals”, and of course social justice warriors are out for blood over his comments. The problem is, he's absolutely correct. These people are violent savages, Anarchists, and when they destroy property they're essentially terrorists. "When you go to work each day, you shouldn't have to worry that a pack of rabid animals will suddenly show up at your home and openly threaten your family," said the FOP President. He's spot on and 100% correct. Sometimes fertile animals need put down, and it's time for the Federal Government to step in and ensure that these police officers can uphold and enforce the law. We at The Goldwater, and all of us as Americans; stand with the police all across the United States of America in their valiant efforts to put on the uniform and risk their lives every single day. Blue Lives Matter. Back the Blue! "Sometimes fertile animals need put down"
BTW these are not anarchists. "Anarchy" does not mean chaos; it only means "no ruler". BLM are communists, for the most part. Law Enforcement's duty is to arrest criminals and person seen violating the law. Tossing urine on anyone is an physical assaulted. If the Urine is infected with Hep, AIDS, or etc. Then ore serious charges can be filed. Any Mayor or City Official (Police Chief) orders a stand down, or a process that stops the arrests of clearly seen criminal acts, whether they be white, black, brown, yellow or poke-a-dotted, is violating State and Federal laws and should be arrested as a co-conspirator and violation of their Oath of Office.